In this article, you’ll discover new research that reveals why you should include visuals in your marketing, and insights on the types of visual content marketers are focusing on. 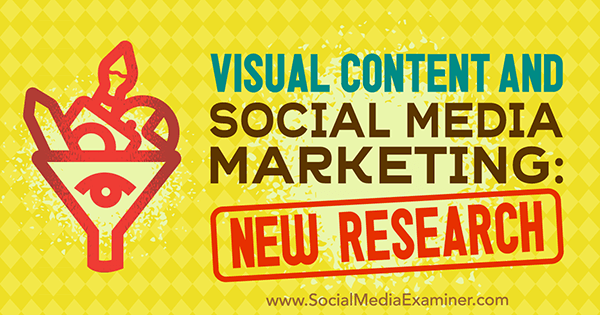 Visual Content and Social Media Marketing: New Research by Michelle Krasniak on Social Media Examiner. According to Brainrules.net, a person who hears a piece of information will remember just 10% of it three days later, while someone who sees that same information in a picture will recall 65% of it. Why is this the case? Since the beginning of time, humans have used sight to consume information, whether it was seeing a threat approaching or “reading” images left on cave walls. When someone reads words, they see the characters as little pictures, which takes the brain longer to comprehend. In fact, according to TapSnap, 65% of people today are visual learners. Webdam reports that our verbal intelligence is dropping while our visual intelligence is rising. They go on to say that we only have about eight seconds before something else catches our attention. (For comparison purposes, goldfish lose interest after nine seconds.) That means social media marketers must make those seconds count. The message about the importance of visual marketing is clear and social media marketers can’t afford to see it as an optional type of content anymore. Venngage’s December 2016 study of 300 online marketers found that in 2015, 41% of marketers said that more than 90% of their content contained visual components. In 2016, that number grew to 53%. That 12% increase in just one year illustrates the fact that more marketers are recognizing the importance of including visuals in their posts. Social Media Examiner’s own 2017 Social Media Marketing Industry Report found that 85% of the 5,000 online marketers surveyed use visuals, up from 74% in 2016. Social Media Examiner asked marketers to identify the types of content they use in their social media marketing. 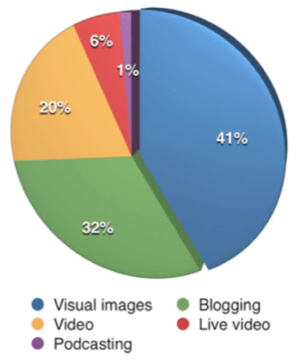 The report also revealed that 41% of respondents said that visuals are the most important type of content, beating out blogging for the top spot. 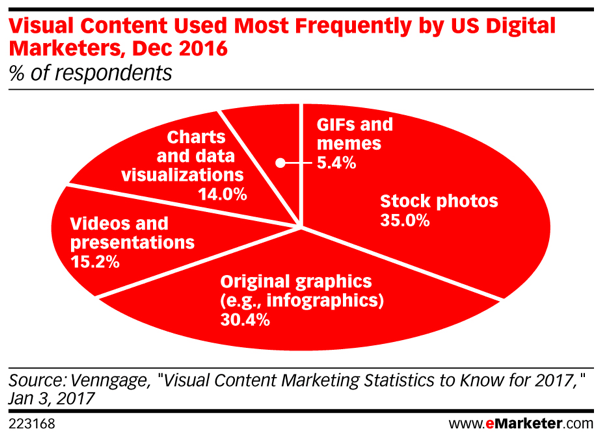 For the first time, visual content surpassed blogging as the most important type of content for marketers who took part in the survey. Consumers are used to having their social network feeds filled with posts from the various brands they follow. They’re used to ignoring ads on the edge of the screen or interspersed with typical posts. The unfortunate consequence of this is it’s becoming increasingly difficult for marketers to get their messages to stand out. Visual marketing is one way to fight through the noise. 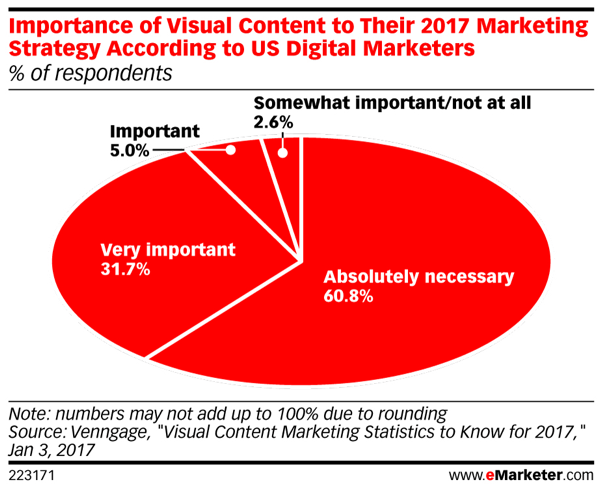 Most marketers say visual content is absolutely necessary for 2017 marketing strategies. Just because they’re on board with using visuals doesn’t mean that they’ve nailed down the types of visual content that work best. 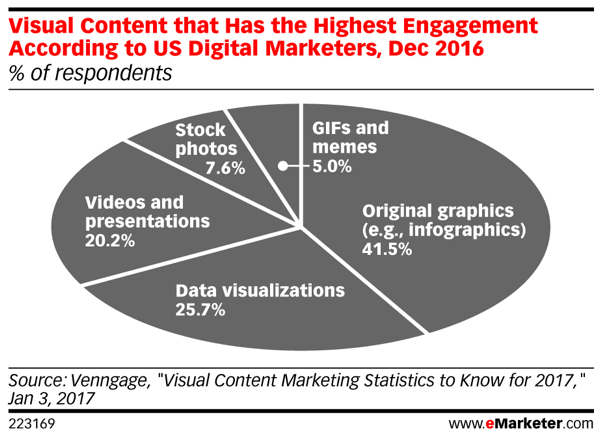 According to Venngage’s study, original images such as infographics get the most engagement at 41.5%, while data visualizations received 25.7% engagement. The remaining one-third of content was split between videos and presentations (20.2%), stock photos (7.6%), and memes (5.0%). 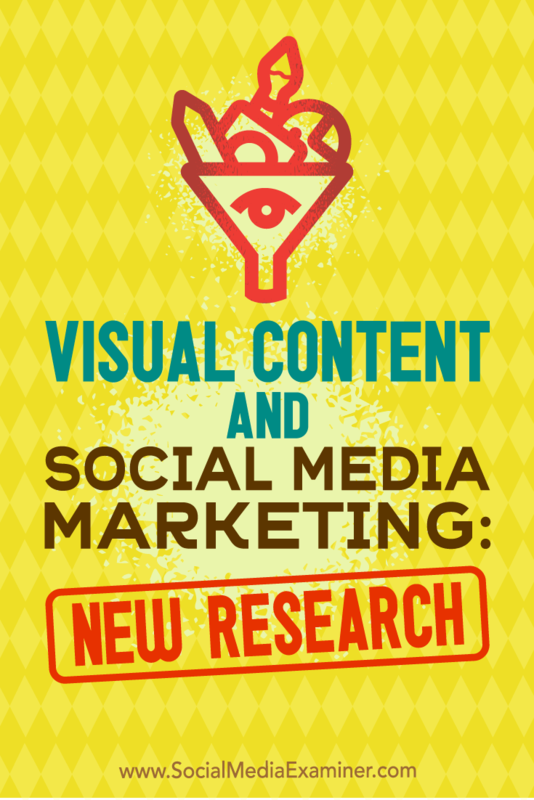 Visual content generates the highest percentage of social media engagement. The respondents’ usage habits don’t reflect this data, however. 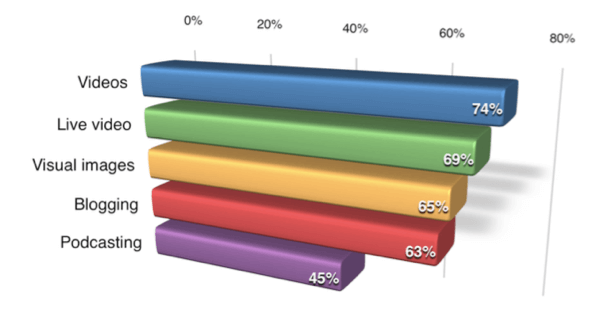 In fact, 35% of respondents used stock photos in their visual posts and 30.4% used original images such as infographics. Videos accounted for only 15.2%, charts and data visualizations 14%, and the more light-hearted GIFs and memes were used 5.4% of the time. Marketers’ recent use of visuals shows a past reliance on stock photos and original graphics. There are various reasons why the content produced by marketers doesn’t reflect what performs best. Venngage’s study determined that nearly two-thirds of respondents found that consistently producing engaging visuals (36.7%) and producing well-designed visuals (29.1%) were the most challenging aspects of including visuals in their social media marketing efforts. Marketers can do a few things to combat these challenges, one being batch-producing their material. For example, in his keynote address at 2017’s Social Media Marketing World conference, Social Media Examiner Founder & CEO Michael Stelzner talked about how they take photos from their events and superimpose them on interesting statistics or quotes. Check out this article for additional tools to help you create more engaging visuals. Periscope states that every day, users watch 110 years of live video on the app. Within their first year, the app had 200 million broadcasts. Livestream reports that 78% of online audiences watch video broadcasts on Facebook Live and 80% would rather watch a live video from a brand than read a blog post. In May 2017, Edison Research reported that out of 1,571 smartphone users ages 18-54 surveyed, 30% watch videos daily on Facebook Live and 23% have broadcast live themselves. Webdam reported that 79% of Internet traffic will be video content by 2018, and posts with videos get 3x the number of inbound links than plain text posts. That same study found that when it comes to video ads, online video revenue grows by 110% annually, which is more than any other type of advertising. These statistics are interesting, considering that the information presented by the Venngage study showed only 15% of online marketers incorporated video in their posts. The reason for that could be the fact it’s a somewhat new frontier in social media marketing and marketers may yet be unsure of the types of videos to produce. Another reason for the hesitation may be due to the cost associated with producing videos. Marketing departments pride themselves on presenting quality, well thought-out content, which is important, of course. When it comes to video, however, high quality is often equated with being expensive, due to both production and labor costs. Whatever the reasons for hesitation, savvy marketers know it’s becoming increasingly important for them to deliver marketing messages to their audiences via video. 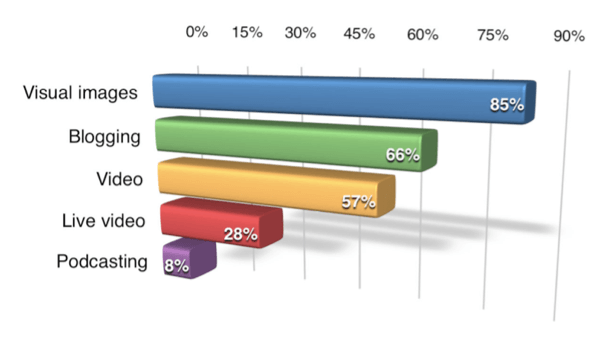 The 2017 Social Media Marketing Industry Report found that video is the content marketers most want to learn about. It’s a common misconception that video must be perfectly polished to be effective on social media. That’s not always the case. While video content should be interesting and useful, with live video there’s no expectation of perfection. If anything, viewers are likely to be more forgiving with live video because they know that anything can happen when the camera is rolling live. It’s important to note, however, that audiences aren’t as forgiving when it comes to prepared visuals. There’s an expectation of higher quality when viewers know the company has time to put effort into creating high-quality content. If it’s appropriate for their audience, social media marketers should “take the plunge” and give live video a try. As with any other type of content, engagement rates are the best indicator of success. In addition to having shorter attention spans, today’s online audiences are bombarded with marketing messages on all social media channels. As is the case with traditional offline marketing, they quickly become desensitized to the messages put before them. It’s up to the social media marketing team to consistently create eye-catching, engaging content. What do you think? What types of visuals do you use in your social media marketing? What visuals have been most effective with your target audience? Please share your thoughts in the comments below.